The Brian Jonestown Massacre is a cult band with a complex history and notoriety that precedes them. 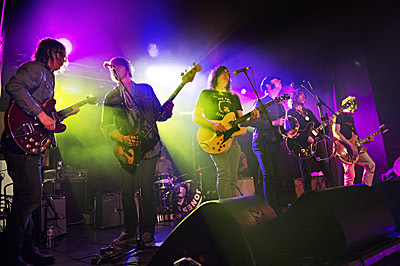 The band is led by Anton Newcombe, whose temperamental disposition and various addictions have been well documented throughout the band’s long recording history, plus founding members Matt Hollywood and Ricky Maymi and longstanding members Joel Gion, Dan Allaire, Rob Campanella, Frankie “Teardrop” Emerson, and Collin Hegna. Needless to say, it is a tight squeeze on the Academy 2’s stage as all eight take their places and begin Whoever You Are in a composed manner, demonstrating none of the chaos that ensued in their earlier career.